While computing changes constantly, most shifts are simple changes that don’t require organizations to change the core of how they work. Not so with cloud computing. While promising significant benefits, it requires organizations to change how they approach IT. 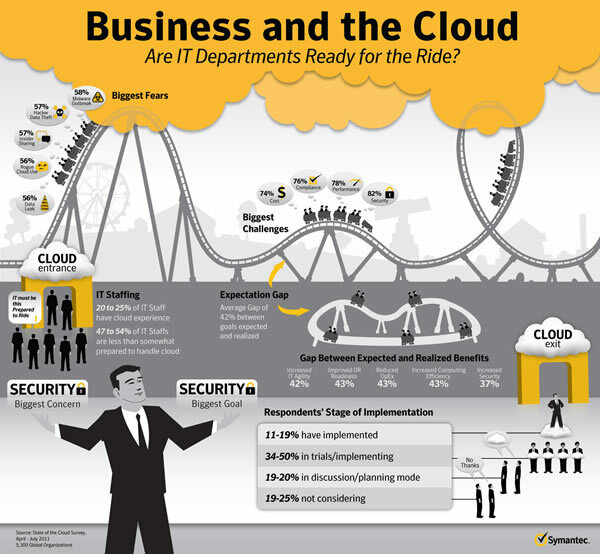 To better understand how organizations are dealing with these changes, Symantec commissioned the 2011 State of Cloud Survey, which gives a unique perspective on how organizations are adopting cloud computing. One of the largest surveys of its kind, it includes responses from 5,300 organizations across 38 countries. The most striking findings are based on the process of moving to the cloud. First, organizations are conflicted about security, rating it both as a goal and a concern with moving to the cloud. Second, the survey found – perhaps not surprisingly – that organizations do not feel their computing staff is fully up to the challenge of moving to the cloud. Resulting from this lack of readiness, the third survey finding is that the adoption of the various types of cloud computing is not very far along, despite tremendous interest (and media coverage). Fourth, among those organizations that have completed the move to cloud, there is a striking gap between the goals they expected to achieve and what they actually achieved.